Now I can understand why Kenneth Oppel's books are so popular. Full of adventure, plots with twists and turns, great cast of full-fledged characters and wonderful imagery and world-building—that's what a reader can expect from his books. My son and I really got swept away with Silverwing and are now reading the whole trilogy. Shade is a young Silverwing bat, known as the runt of his colony. He is curious about wanting to see the sun because for centuries now bats can only hunt and move about at night and must roost during the day as they are forbidden to see the sun. His impulsive actions lead to several events that culminate with a war with the owls. When his colony starts their long and dangerous migration to Hibernaculum, Shade gets lost in a storm. He is alone until he meets Marina and together they go through a remarkable journey as they try to rejoin his colony, overcoming numerous obstacles, harsh winter conditions, and two Vampyrum Spectrum bats that play a dangerous game with them. This was a fantastic story. My son especially loved Shade, who is brave, smart but also sometimes reckless and proud. We also loved the interaction between him and Marina, a Brightwing bat, that had us laughing at times. Shade's adventure is thrilling and suspenseful and it was hard to put the book down at night after reading a few chapters. There is not a dull moment as Oppel introduces to us a slew of characters that Shade and Marina meet on their journey, a journey that shapes who they are as they grow in maturity and in their relationship. Goth, the Vampyrum bat was so impressive with his 3-feet wingspan and his carnivorous diet, including bat (making him a cannibal in the eyes of the other bats) as opposed to the other bats who only ate insects, that we were prompted to do other research. 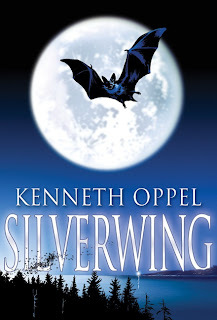 Oppel's website gave us more information on his books and he states that he based his characters on real species of bats. We found this fascinating and did more research on bats, their habitat and their eating habits. My son even found a cartoon movie version on Youtube of Silverwing and was thrilled! Lastly, I want to mention that my son learned a lot of new words with this book, because as I mentioned before, the world building is wonderful and Oppel uses just the right words to stimulate our imaginations. If you have a reluctant boy reader, I recommend reading this book with him. He will get caught up in an amazing adventure and you with him. Disclosure: This book was given to my son as a gift. We were not told how to rate or review this product.